Get Hastings Reading, which had its launch day on Friday 25 January, is a new initiative to inspire children and young people to read for pleasure and gain the confidence they need to make the most of every opportunity. It is the result of a partnership between the National Literacy Trust and the Department for Education’s Opportunity Area in Hastings, which places education at the heart of overcoming obstacles to social mobility. On launch day, nearly 2,000 children took part in a host of literacy events across the town, ranging from a book-themed bus tour to exciting assemblies in 14 local schools, while every school in Hastings received a bundle of 25 books for their school library. The day was also the perfect opportunity to start the Hastings 100 Reads initiative – a hunt for the town’s top book recommendations. 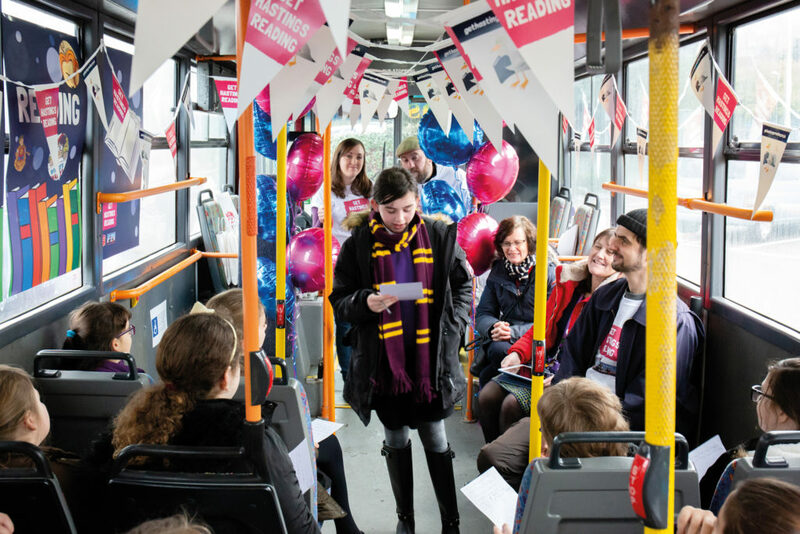 The book-themed bus visited 150 children in Years 5 and 6 from five local primary schools across the Hastings area. The children – who came from Robsack Wood Community Primary Academy, Hollington Primary Academy, Ark Little Ridge Primary Academy, Ore Village Primary Academy, and The Baird Primary Academy – were invited on board and treated to performances from local poet Lucas Howard. Lucas performed three of his own pieces, and the children then wrote their own poems and raps about things that were important to them. Each child was gifted a new book, donated by Penguin Random House UK, a Get Hastings Reading Bookmark, and a Hastings 100 Reads entry card to take home. The day finished with an event held at Stade Hall where local partners and dignitaries met to learn more about the campaign and pledge their support. Jonathan Douglas, Director of the National Literacy Trust, opened the speeches highlighting the exciting events of the day and Amber Rudd MP spoke about the key link between social mobility and literacy. Delegates also heard from the Mayor of Hastings Cllr Nigel Sinden, performance poet Lucas Howard, National Literacy Trust Hastings Hub Manager Graeme Quinnell, and two MY Trust youth ambassadors from Ark Helenswood Academy.